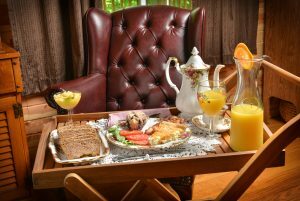 Enjoy a special homemade breakfast while staying at Cave Hill. Our wonderful next door neighbor, Margaret Edwards would love to have you come enjoy a hearty breakfast. Just down the road: Margaret and her husband Ron live less than a 1/4 mile away at 34 Lake Drive, just off Cave Hill Road on the way up Cave Hill. Margaret’s cooking is outstanding. She offers breakfast at 8:30 most mornings in her spacious and welcoming home. 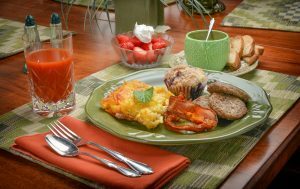 Big Breakfasts: A full, warm breakfast often includes quiche, breakfast casserole or traditional eggs, bacon and sausage, homemade muffins or bread. 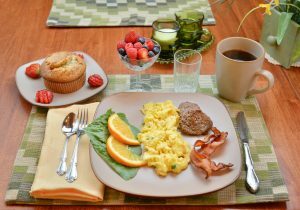 Featured Photos: These photos show some of the breakfast specialties. If you have dietary restrictions or food allergies, please let Margaret know. The cost is $10 per person. Add to your reservation then contact Margaret directly at 513.602.4123. Breakfast at Margaret’s was a wonderful experience. We loved her home, the food, and her hospitality. We came back later and walked her path behind her house (after the grass had dried out) and she invited us in to meet her husband and sit on the back porch awhile.